The Vegan Mouse: Apocalyptic Beauty! 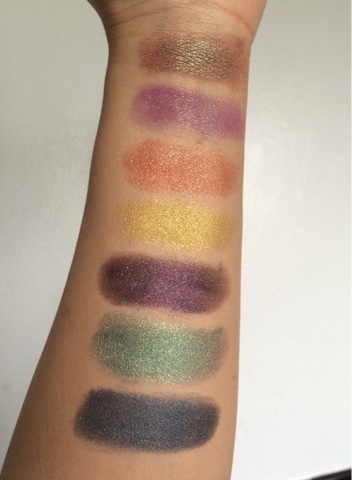 So excited to share with you guys a new indie vegan cosmetics company that I'm already crazy about. Love at first sight! It's all vegan and also inspired by pop culture, horror films and all things delightfully absurd! 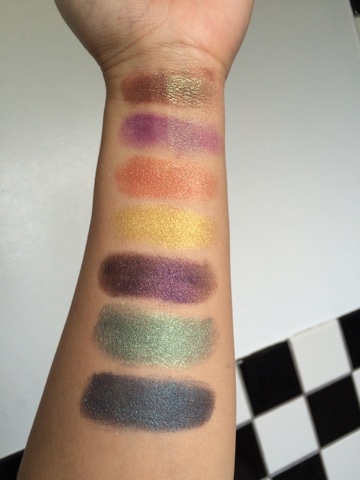 I was able to purchase a blogger pack at the Etsy shop which came with 1 full size shadow of my choice plus random samples. 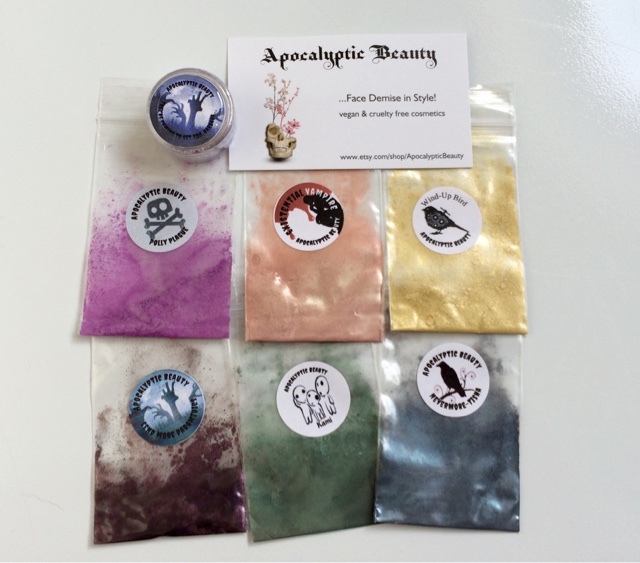 Apocalyptic Beauty is run by a lovely woman Alisha who is also Rhapsodii, a beauty blogger on you tube! Love her videos. 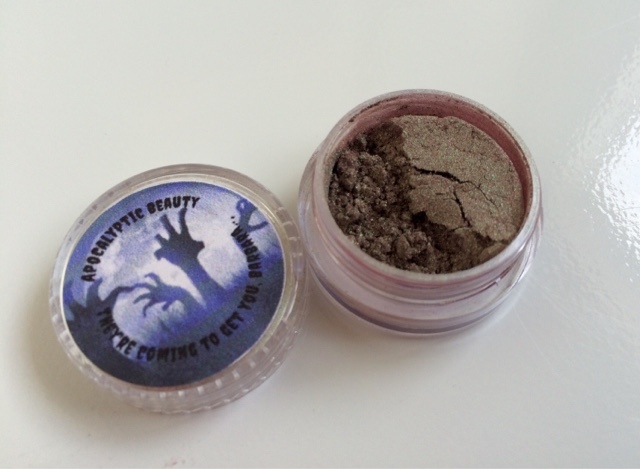 My full size eyeshadow choice, "They're Coming To Get You, Barbara!" 1. They're Coming To Get You Barbara (my full size choice)- A beautiful rust red with a strong green shift. Always wanted a color like this. It is just what I expected! 2. Polly Plague- purple with green iridescence. Love this shade! 4. Wind-Up Bird- yellow gold. So shiny. 5. Send More Paramedics!- I was hoping I'd get this color as it was my second favorite when I had to choose my full size. It's a shimmery blackened purple with red and blue sparkles. 6. 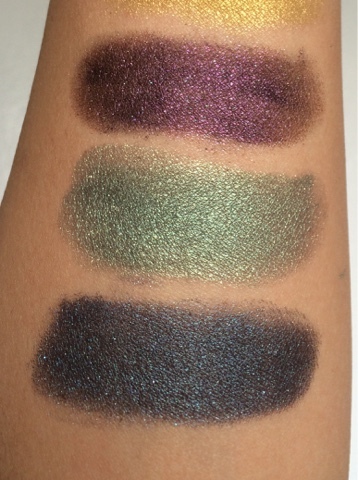 Kami- shimmery forest green with gold shift. 7. NeverMore Tisha- blue black with blue shift and aqua sparks. Another fave. 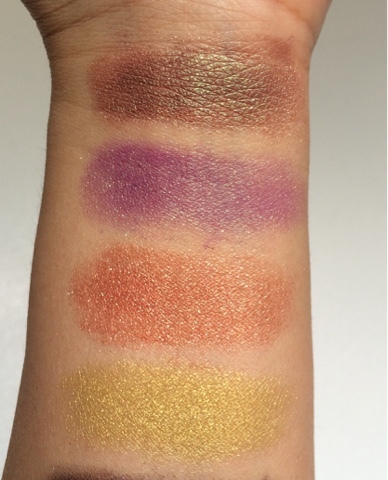 I hope my swatches look okay! I wanted to use tape but there where too many colors and I didn't have time. I was racing against the clock because Hank was napping and I was expecting him to wake up any second! I absolutely love these shades and the formula feels smooth and easy to apply. Can't wait to wear them on my eyes. Go buy some now!!! I have seen swatches with tape, excuse my ignorance but what is the tape for? The tape creates a neater and cleaner area for swatches. 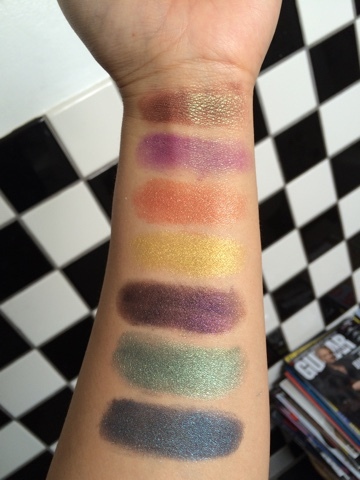 Swatches look like neat rectangles instead of big blobs like mine! Love the Night of the Living Dead quote :). 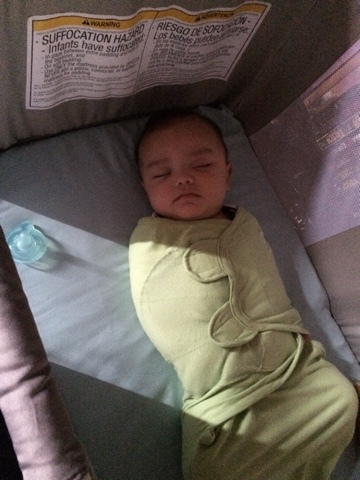 Such pretty shadows and I wanna nom on that adorable baby burrito!